Posted on 26 July, 2017 at 11:58 am. 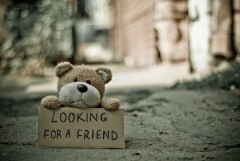 We all know that life can be lonely sometimes – even for people who are surrounded by friends and family. Loneliness doesn’t necessarily come from being alone: it is caused by a mismatch between the social interactions you want and the ones that you actually get. Technology can help very lonely people to feel less alone, or can be a tool to help lonely people engage more with those around them. In today’s blog, we hear the story of Jamie, a young man with severe learning disabilities whose life was changed by the great work of Solihull Life Opportunities and access to some WaveLength technology. Although Jamie can’t speak his non-verbal communication has improved. He will now come face-to-face with us when he needs to convey something, like having the TV or music changed, in a way that he wouldn’t have done before. His life skills have improved – for example, he can now hold a loaded fork and feed himself. He does drop the fork once the food is in his mouth, but this is still a great leap forward! He seems to be more content and inquisitive, and less stressed out by life. SOLO keep him active and interested in what is going on around him, and when he is at home he now makes his way around the house looking for things and people to play with – especially his brother! Jamie didn’t used to sit with us on the sofa as a family. Now he will sit and hold our hands while we all watch TV. SOLO also provide Jamie with a structure of daily tasks and activities and we try to emulate these at home. This makes him smile and he laughs out loud. 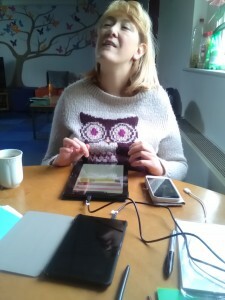 Some of our members can experience high anxiety and we find that often the tablet computer can be used as a distraction tool by encouraging the member to play a game that they enjoy or to research a new activity or a place they are due to visit. Many of our members can be very worried about going to places they have not been before as they do not know what to expect. The tablets are so useful as the members can do a virtual tour or look at a particular place to familiarise themselves and to see what the place or activity looks like. Similarly with people. If a new member of staff is joining the team or a volunteer is going out on a trip then the members can be sent a photo of the new person so they can see what they look like before the actual trip or event. This helps to ease their anxieties and reduces behaviours. 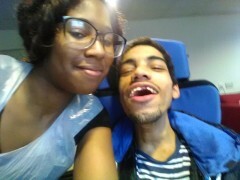 The members have used the tablets to take photographs when going out and about and have filmed each other participating in activities and learning independent living skills. They very much enjoy participating in the filming, either being filmed and interviewed on camera themselves or by filming their friends. We were all so happy to hear all the different ways that our technology helps SOLO in their work, and the difference that it can make to the lives of young people like Jamie and their families. Thank you to SOLO and Jamie’s mum for sharing their stories with us!